So who’s ready for this eclipse? It’s been quite the anticipated event here in St. Joseph MO considering we are on the line of complete totality for over 2 minutes and 38 seconds! (Check my Instagram account for the video!) I’m kind of excited. But not too excited about the expected crowds they are projecting. Last I heard they think we will go with a population of 80,000 to 500,000 in just a day. I hope they are wrong. Either way, I’m going to enjoy the spectacle in the comfort of my own yard with a bowl of pasta. Ok – I was just trying to tie my eclipse rambling to this recipe but I probably will have pasta tomorrow because it’s Monday and that’s typically what we eat on Mondays. Tomatoes are bountiful right now. 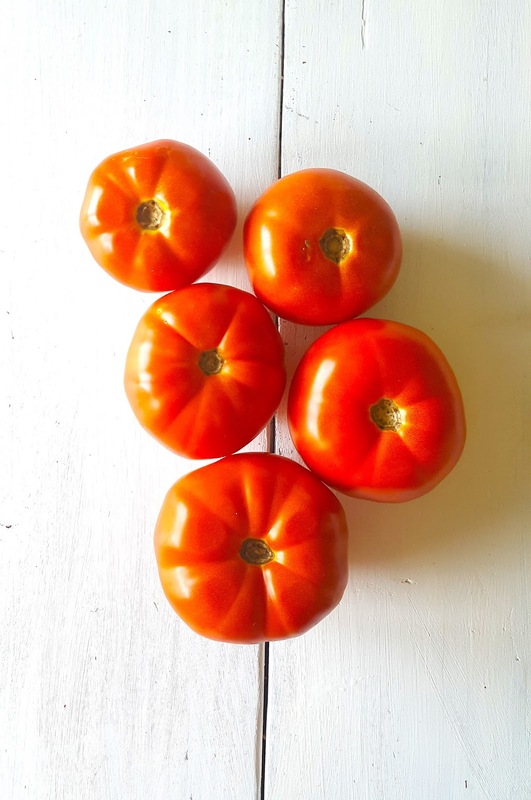 We’ve had a generous amount of rain this last month making the tomato crop big, juicy, and oh so sweet. Farmer’s markets are overflowing with every size, shape, and color of tomato you can imagine. When we got our CSA box this week I was excited to see the giant Big Boys that were screaming to be turned into my Grandmother’s Pasta Sauce. My Great Grandmother didn’t have a large catalog of recipes. She stuck to a handful that she circulated every week and spaghetti was on the list. She would have Grandpa bring in tomatoes and other produce from the garden that she’d use in the sauce and let it simmer for a long time. She’d then always serve it with sautéed spinach only because I was obsessed with Popeye the Sailor Man. I’ve been making her recipe for years. I now even make it in very large batches so I can preserve it for later in the year. 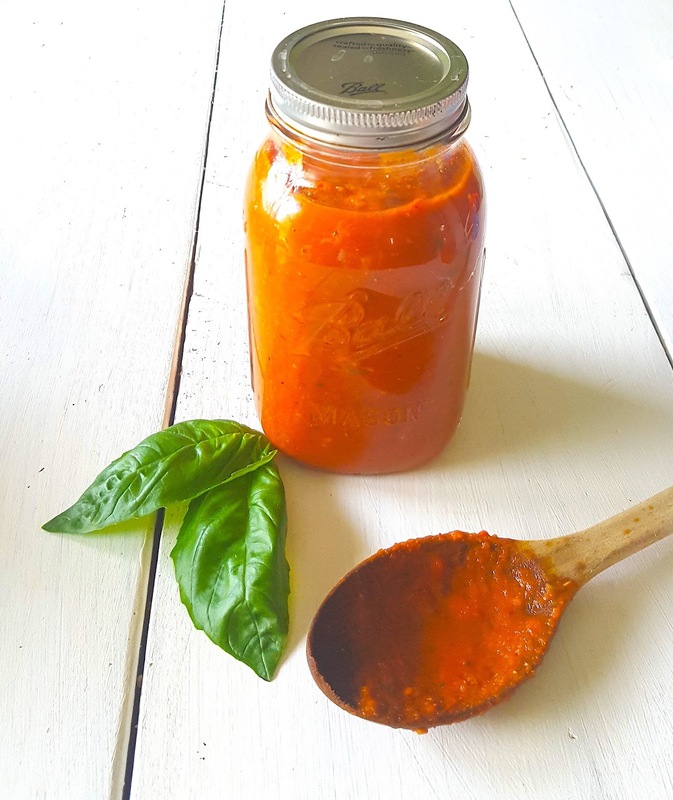 I can’t even tell you how amazing it is to open up a jar of pasta sauce in the middle of winter from summer produce. Who says you have to deprive yourself in order to be a little more environmentally friendly? ZERO WASTE TALK | How is this recipe zero waste? All produce can be purchased in season and package free. Use homegrown herbs or purchase spices in bulk with your own containers to eliminate any unnecessary packaging. 5 cloves of garlic – I mean, can you have too much garlic? Chop tomatoes and pepper and put onto a cookie sheet with the garlic. Drizzle olive oil over everything and lightly sprinkle with salt. 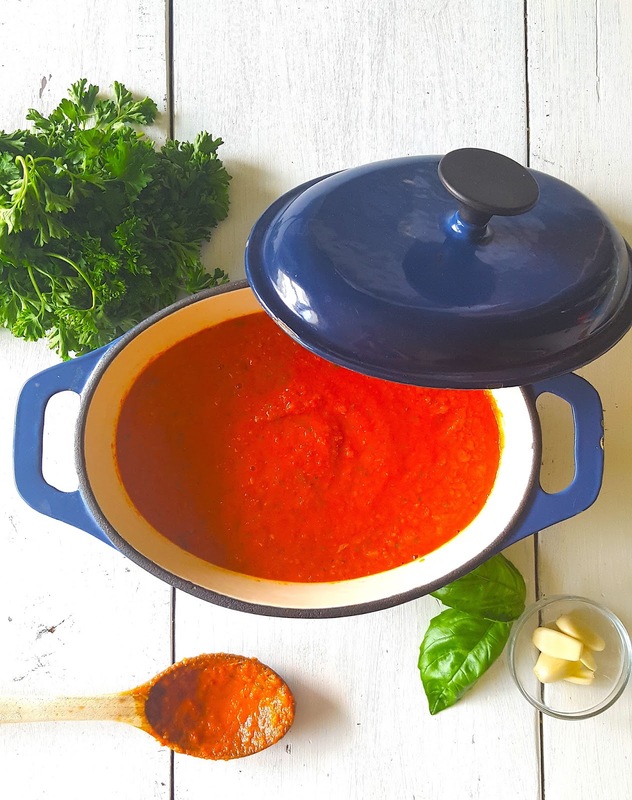 Roast the tomatoes – including skins, pepper, and garlic in a 400 degree F oven for 25 – 30 minutes or until tomatoes are slightly wilted. In a stockpot, sauté celery and onions with a little bit of olive oil until translucent. Add tomatoes, pepper, and garlic to the stockpot along with the tomato paste, parsley, Italian seasoning, basil, red pepper flake, sugar, salt, and pepper. Simmer until all flavors have had time to build – about 30 minutes. Use an emersion blender to blend into a smooth sauce. Serve immediately or can for later. Zero Waste Week 2017 – I Challenge You! Delicious comes water in my mouth.